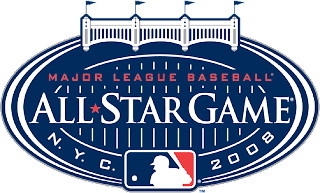 Your NL All-Star Update ~ The Bucky Channel - The World of Sports from Wisconsin's Perspective. You have to admit, the Get Out the Vote campaign the Brewers have been running has been pretty effective so far. They seem to be doing a good job of campaigning at Miller Park, and it's also nice that Brian and Bill devote half of their FSN broadcast telling us to vote. So far, it's seems to be working. * Prince Fielder is 4th for NL First Basemen, with Lance Berkman as the current leader. * Rickie Weeks is 5th out of the guys playing 2nd, but there's no way he'll catch current leader Chase Utley. I'd be more upset, if he actually deserved it. * Chipper Jones is the obvious choice for the NL at 3rd, but Bill Hall is 4th in voting? I say we start using the write-in vote for Russell Branyan. * Jason Kendall is 4th in at the catcher position, well behind Geovanny Soto. * Soriano, Fukudome, and Griffey Jr. lead the NL in the outfield. However, Soriano's injury would open his spot up to the 4th place guy, currently Ryan Braun. Let's see if we can get him into the top 3 outright. Also, Corey Hart is 14th in the outfield. Not much time left to vote, so let's get after it. The complete NL list of leaders, as well as a link to vote online, can be found on MLB.com.